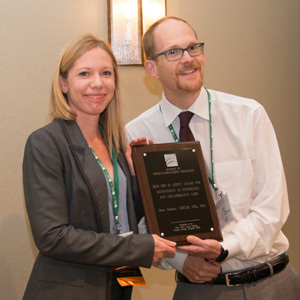 Jane Walker, MBChB, MSc, PhD, MRCPsych, receives the 2018 Lipsitt award from Jeff Huffman, MD, FACLP, chair of the Research & Evidence-Based Practice Committee and first recipient of the award in 2014. The awardee is invited to present a one-hour workshop at the ACLP annual meeting. A cash award is provided to underwrite costs to attend the meeting and deliver the presentation. Annual meeting registration is also waived for the winner. Don R. Lipsitt, MD, for whom the award is named, is the founding Chairman Emeritus of the Department of Psychiatry of Mount Auburn Hospital, a Harvard teaching hospital in Cambridge, Massachusetts. As Clinical Professor of Psychiatry at Harvard Medical School and as a graduate of the Boston Psychoanalytic Society, he has taught medical students, residents, and primary care physicians for over 50 years. He is the founding editor of two journals for consultation-liaison topics, General Hospital Psychiatry and the International Journal of Psychiatry in Medicine. Presidencies include the International College of Psychosomatic Medicine, American Association of General Hospital Psychiatry, and Massachusetts Psychiatric Society. 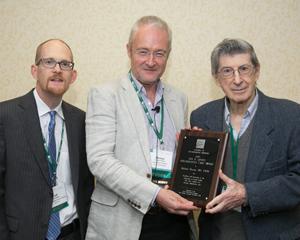 Dr. Lipsitt was the 2000 recipient of the Academy’s Eleanor and Thomas P. Hackett Memorial Award. Throughout his career, Dr. Lipsitt has been a strong advocate for the integration of psychiatry and medicine. He resides in Cambridge, Massachusetts, with his wife of 63 years. They have two sons, Eric and Steven. Nominations for the Don R. Lipsitt Award may be made by the candidates themselves or by others on their behalf. Nominations are submitted online using the Lipsitt Award Nomination Form. The form must be submitted by April 1.